The revelation that U.S. prosecutors have prepared an indictment against Julian Assange, a fact the government inadvertently made public Thursday evening, has again fanned the flames of speculation over what class of crimes he might be charged with should British authorities finally capture and hand him over to the United States. 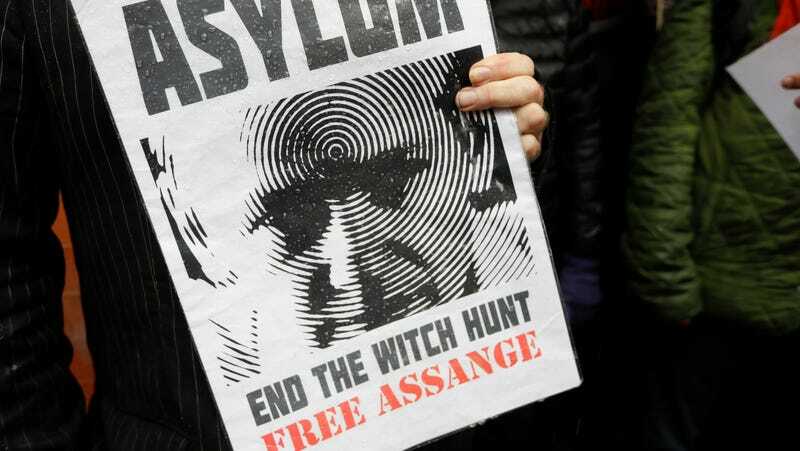 Legal experts have long speculated that Assange could face charges under the World War I-era Espionage Act for the dissemination of classified U.S. government documents. Sealed court evidence reviewed by Gizmodo, however, indicates prosecutors may have proof that the WikiLeaks founder gave support—if only after the fact—to criminal hackers linked to some $700,000 in fraudulent credit card charges; and that WikiLeaks provided them with custom software designed to help sort through millions of stolen corporate emails. Anxious defenders of the free press have long worried that he may be charged with espionage; a prospect that doesn’t bode well for other journalists who obtain and publish classified information. While the Supreme Court has upheld the right of journalists to publish illegally obtained information—provided they do not themselves participate in, or conspire to, break the law—it is far from clear whether reporters who expose national secrets, including classified defense information (as Assange repeatedly has done), are equally protected. Expert opinions on this vary widely. News of the indictment comes as the special counsel, Robert Mueller, is investigating ties between the Trump campaign and the Russian government, which U.S. intelligence officials have implicated in cyberattacks on Democratic officials amid the 2016 campaign. Indictments by Mueller finger more than a dozen Russian intelligence officials in hacking the Democrats and, further, using an “organization” reported to be WikiLeaks as a vehicle to widely disseminate the stolen emails, and damaging the Clinton campaign. There’s been no indication as of yet that the 2016 events are related to the Justice Department’s unintentionally publicized charges. The Espionage Act is not the only weapon in the U.S. government’s arsenal. For nearly a decade, investigators assigned to the multi-agency Wikileaks investigation have intercepted various communications between Assange and criminal hackers (i.e., his sources) who on myriad occasions broke federal laws while pillaging heaps of classified, confidential, and propriety information. Leaked court records, sealed by a Manhattan federal judge in 2012—portions of which have been previously published—show that in the immediate aftermath of the 2011 hack of private intelligence firm Stratfor, Assange may have provided support to another hacking group, a source that provided WikiLeaks with millions of emails stolen from Stratfor’s servers. Other documents show that a former FBI informant, Hector Monsegur, repeatedly told fellow hackers that Assange had ordered a cyberattack against a U.S. ally. Together, the FBI files show the U.S. government has amassed at least circumstantial evidence implicating the WikiLeaks founder as a conspirator in years-old computer crimes, which may also cast doubt on whether WikiLeaks is, as its supporters claim, merely a publisher of whistleblower material protected by under the First Amendment. A screenshot of a leaked chat log shows hacker Jeremy Hammond (yohoho) informing cohort Hector Monsegur (leondavidson) that Assange had given him access to a “search engine script” so he could more easily parse the stolen Stratfor emails. The aid WikiLeaks offered AntiSec took place during a period in which the hackers were actively committing financial crimes using the stolen credit cards of Stratfor customers. Obtained by the FBI during surveillance of Hammond, internet chat logs reveal that the collaboration between WikiLeaks and AntiSec well exceeded the traditional and, potentially, legally permissible relationship between a First Amendment-protected media outlet and a source offering illegally obtained material. While it is not unlawful for reporters to accept stolen or hacked documents, it is unusual, to say the least, for journalists to reciprocate by offering the hackers access to home-brewed tools to help better process the data they’ve stolen. Hammond, also known by the hacker alias “Anarchaos,” pleaded guilty in March 2013 to one violation of the Computer Fraud and Abuse Act (CFAA), for which he was sentenced the maximum 10 years imprisonment eight months later. Attorney Jay Liederman, a criminal defense attorney who handled several cases involving the CFAA, said U.S. Attorneys could easily replicate the charges against Brown in Assange’s case. “If they charged Barrett Brown with identity theft for republishing a link to the Stratfor files, they might try to do the same with Assange,” he said. The government’s case against Brown was pure “nonsense,” he said, adding that the same would be true if the government chose to level the same charges against Assange. Donald Trump Jr. could not immediately be reached for comment. WikiLeaks did not yet respond to a request for comment. On Thursday, journalist Emma Best published an exhaustive report that, in part, details accounts of WikiLeaks associates soliciting cyberattacks against the Icelandic government, leading officials there into cooperating, at least temporarily, with the FBI investigation of Assange. Gizmodo has confirmed the veracity of source material used by Best, based on document metadata and knowledgeable sources linking it to the Southern District of New York; specifically, the series of 2011 chat logs in which Monsegur references the WikiLeaks’ request. Additional sealed records not published by her, but obtained and reviewed by Gizmodo, show Monsegur likewise informing other AntiSec hackers of the Icelandic hacks, which he again claims were carried out “for him” (Assange). The U.S. government has never prosecuted a journalist under the Espionage Act—which is not to say it never will. The limits of the act have simply never been tested. And for any prosecutor eager to push the envelope, they are unlikely to ever find a more desirable test subject: Assange is a foreigner; he does not enjoy the same level of public support and reverence he once did; there are unsettled, albeit widely disregarded, accusations of sexual misconduct against him; and the opinions of many potential jurors are likely to be colored by pre-conceived notions of his potentially non-existent relationship with Moscow. But he is also the recipient of a Martha Gellhorn Prize for Journalism; Australia’s Walkley Award for Journalism; and the Sam Adams Award, which is bestowed by intelligence veterans, many of whom have been likewise dogged by the U.S. government for defiant acts of transparency. Hector Monsegur, aka “Sabu,” telling Hammond and other AntiSec hackers that he and “Kayla,” a LulzSec hacker later revealed to be South Yorkshire (U.K.) resident Ryan Ackroyd, hacked the Icelandic government on WikiLeaks’ behalf, on December 26, 2011. While the Espionage Act prohibits specifically the disclosure of “national defense information” that the possessor “has reason to believe could be used to the injury of the United States or to the advantage of any foreign nation,” that’s a definition that could theoretically apply to any number of people working today at the Washington Post, up to and including the executive editor, Martin Baron, himself. But the courts have also found “specific intent” (as opposed to intent which is merely inferred) to be a requisite of espionage convictions; i.e., it falls on prosecutors to prove, beyond the shadow of a reasonable doubt, that Assange not only knew that publishing national secrets would harm the United States, but that the harm itself was his specific purpose all along. Whatever evidence the U.S. government’s sweeping criminal investigation into Assange has uncovered over the past nine years, that’s a daunting hurdle to clear. It will need to prove that WikiLeaks’ stated mission (“to receive information from whistleblowers and censored journalists, release it to the public, and then defend against the inevitable legal and political attacks”) is merely a cover for something far more sinister. The question now is whether the U.S. government will be determined to roll the dice with an espionage charge or find an easier route to seeing Assange locked behind bars.